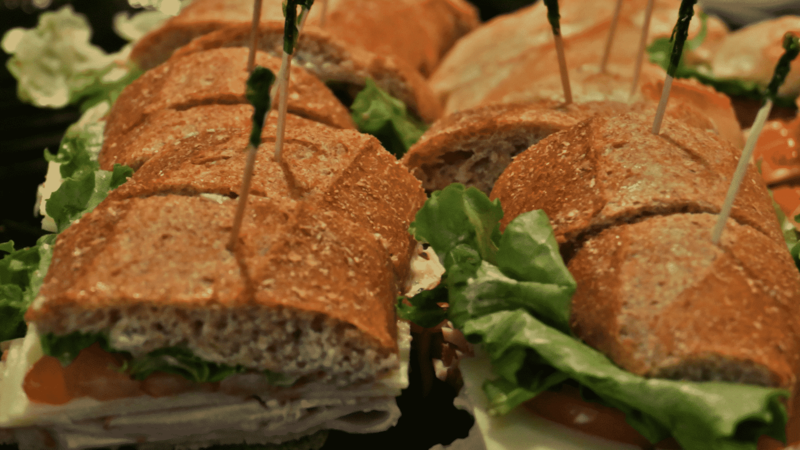 Amazing sandwiches and more ready for pickup or delivery! All sandwiches are cut in half and served with our dijon mayo. If desired, please specify white or wheat bread. Marigold Roast Beef, Onions, Cheddar Cheese, Lettuce and Tomato. Homemade Tuna Salad with Lettuce, Tomato, Onions, Sprouts and Bell Peppers. Thinly Sliced Hickory Smoked Turkey Breast, with Swiss cheese, Lettuce and Tomato. Thinly Sliced Hickory Smoked Ham, with Swiss cheese, Lettuce and Tomato. Coppacola, Mortadella, Prosciutto, Soprassatta, and Hard Salami. Served On Our Rustica Bread with Pepperoncinis, Olives, Onions, Bell Peppers, Lettuce And Tomato. Seasoned And Grilled Vegetables Topped With Melted Cheddar Cheese, Sprouts, Lettuce And Tomato. All Salads Come With Complementary Bread And Butter. Fresh Romaine Hearts, Tomatoes, Croutons, and Parmesan Cheese. Sliced Chicken on the Side. Fresh Mixed Greens, Ham, Turkey, Ba con, Hard Boiled Egg, Mushrooms, Peppers, Tomato, Red Onions, Cheddar, Swiss and Blue Cheeses. Fresh Mixed Greens, Cucumber, Tomato, Bell Peppers, Kalamata Olives, Feta Cheese and Red Onion. Fresh Baby Spinach, Mushrooms, Red Onions, Tomatoes, Cheddar Cheese, Hard Boiled Egg, Sprouts and Crisp Peppered Bacon. Fresh Mixed Greens, Green Beans, Red Potato Wedges, Kalamata Olives, Sprouts, Pepperochinis, Red Onions, Topped With Our Tuna Salad. Fresh Romaine Hearts, Tomatoes, Croutons, and Parmesan Cheese. Marinara, Mozzarella, Fresh Tomato Slices, and Chopped Basil. Marinara, Mozzarella, Pepperoni and Parmesan. Marinara, Mozzarella, Spicy Italian Sausage, Bell Peppers, Onions and Olives. Swiss and Amish Blue Cheese, Grilled Chicken, Bacon, and Fresh Tomatoes. Feta and Mozzarella Cheese, Sun-Dried Tomatoes, Fresh Spinach, Artichoke Hearts, Olives and Capers. Half-Chicken Slow Roasted, Seasoned With Rosemary and Garlic. Served with Garlic Mashed Potatoes and Roasted Vegetables. Grilled Flat Iron Steak thinly sliced. Served with Garlic Mashed Potatoes and Roasted Vegetables. Grilled seasoned Chicken Breasts served with Garlic Mashed Potatoes and Roasted Vegetables. THIS FORM IS ONLY FOR CATERING AND BANQUETS. PLEASE CALL 719-599-4776 FOR NORMAL DINNER RESERVATIONS.